Epiphany installed its Cardio Server in a 220-bed hospital in Southern California in 2010. Like most hospitals that do not have an ECG management system, workflow for cardiography results before Epiphany was labor intensive. This essay describes how Epiphany streamlined stress workflow with dozens of customized forms for this hospital’s cardiologists. The hospital went live with Epiphany’s Cardio Server in December, 2010. Cardio Server was configured to accept imports from resting ECG, stress, and Holter; upon physician confirmation, Cardio Server exports results to the hospital’s EMR. Of these three modalities, stress was the biggest problem. Before Epiphany, stress workflow was laborious. Technicians printed stress studies and placed them in the individual cardiologists’ boxes in the reading room. Cardiologists had to make a trip to the reading room to read the stress studies and dictate a final report. Transcriptionists then created a preliminary report with the cardiologist’s dictation and placed the final report back in the cardiologist’s box for final review and signature. Delays, depending on reading schedules, were not uncommon. The challenge Epiphany faced was to get the cardiologists to read on-line, thus eliminating the trip to the reading room, eliminating transcription, and eliminating the multiple paper copies of the stress studies. This challenge was harder given the cardiologists all had different ways they interpreted different types of stress testing. Epiphany’s Cardio Server is a pure-web, browser-based product. As such, cardiologists access it from any computer in the hospital, from their office computers, or their home computers; on-line reading eliminates multiple paper copies. Pure-web access also solved the problem of the cardiologists making daily visits to the reading room; pure-web access speeds the time between study completion and diagnostic test results posting to the EMR. Epiphany solved the second problem, the variance in types of stress tests used by the individual cardiologists, by creating customized forms. Forms are fully formed paragraphs that duplicate what a transcriptionist normally types. By taking discrete data results out of Quinton Q-Stress, Epiphany automatically populates those results into the appropriate place on the form (e.g., maximum heart rate, maximum ST level, etc.). Transcription eliminated. Finally, Epiphany created several forms customized to each cardiologist’s writing style. Multiple forms were built for each cardiologist and for each type of study. 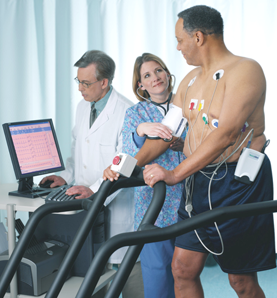 Customized forms were created for routine exercise testing, stress echo, Cardiolite, Lexiscan, Dobutamine stress and Dobutamine echo. Epiphany threw in some forms for Holter for good measure. Now all that is required of the cardiologist is to select the appropriate form with a click, read the populated results, tab to any of the variable fields for pick-list or free-text entry, and confirm it. The study is digitally signed and posted to the EMR. The best part is that all this comes standard with the purchase of Cardio Server! No extra budget for this custom work is required. We do it before we get on site, while we are on site, or after go-live. We do it to make your days shorter, not longer.